My first experience with one of the Virgin airlines was when I flew on Virgin Atlantic to London two years ago en route to South Africa. I was fortunate in that I flew in Business Class, what Virgin Atlantic calls Upper Class. I wrote about it in this post, and along with the Clubhouse airport lounge, I felt (and still do) that these luxury products are amongst the best in the world. Well I just had another opportunity to fly with Virgin Atlantic, but this time in Premium Economy and I’m eager to share my feelings. Complimentary drinks before and during the flight. A choice of three meals, including a vegetarian option, served on real china with accompanying stainless steel cutlery. After dinner liqueurs to finish the meal off nicely. Over 300 hours of the hottest on demand entertainment options available on a seatback TV – including 30+ movies, TV shows, video games, music and more. Cushy, comfortable leather seats have an increased seat width of 21 inches. An extra seven inches of legroom means passengers can stretch out and relax. Covered in sumptuous purple leather, the seat has up to 38 inches of seat pitch and a recline of 16 degrees, which means passengers can relax in their own quiet space. The seat boasts advanced ergonomics with lumbar support, an adjustable headrest with wings and a dual position footrest. In-seat laptop power so you can work worry-free available on Heathrow routes. Over 300 hours of the hottest on demand entertainment options available on a seatback. A devoted Premium Economy cabin crew to look after passengers’ every need. Dedicated check in, priority boarding and disembarkation. A complimentary amenity kit with all the passenger essentials including a toothbrush and toothpaste, eyeshades, a stylish pen, socks and earplugs. The amenity kit mentioned was an issue for me, I’ll explain more in a moment. All of this looks great on paper, but it’s the real experience that means something. Boarding the plane I passed by the standard Austin Powers bar that welcomes all guests, full of champagne and juices; the perfect introduction to what ultimately is a fun and quirky airline. Sitting in premium economy one of those drinks is offered to all passengers, meant to be enjoyed in big, oversized leather chairs. Pitch numbers and legroom stats can be confusing, but the experience of having much needed extra space on a 8 hour flight is a precious perk. The lady next to me smiled and said, “Well this is a nice treat.” It was indeed. What I like about premium economy sections are some of the perks one normally only enjoys in business class. Silly little things like hot towels before a meal mean a lot to me. As promised, the food is also enhanced in premium economy and soon after takeoff we were given a menu with the options for the flight. The food was good, not too fancy with little quirky moments that I love, like fruit popsicles as a snack. The one thing that surprised me was the lack of an amenity kit. Other premium economy flights I’ve flown, including on sister airline Virgin Australia, provide amenity kits including socks, lotions and toiletries, a nice perk on along flight. That was lacking on my Virgin Atlantic flight, a strange oversight given that they list it as a perk. I was on a day flight, but that shouldn’t matter. It should always be given out no matter the time of day. Amenity kits notwithstanding, the flight experience was a pleasant one. I had plenty of movies to watch, space in which to enjoy them and service that was kind, fast and friendly. It’s these little things that make any flight more bearable and Virgin Atlantic goes beyond that to make it a fun experience, a rarity in a travel age that seems to be taking more and more away rather than heaping benefits upon passengers. Have you flown with Virgin Atlantic? What did you think? sounds quite convincing. We are used to flying to oz in Biz class with Emirates but jut 10 hours to Miami does not seem to warrant the price of Biz class when all we want is a comfy chair and not stuck together like cattle! Thanks for a good description. This was super helpful! We chose to pay the extra dollars to upgrade to Premium Economy for upcoming trip to the UK and it sounds like we will not be disappointed. Thank you so much for this great review! We flew from Heathrow to JFK just a few weeks back, we upgraded paying £250 per person one way. I cannot identify with your article. My advice is save your money and pay for extra legroom in economy. This was the worse flight I have ever been on, dirty, tired plane, tired fed up looking staff. No laptop charger as promised, no usb connectivity as promised, no champagne as promised, Poor quality entertainment system which was filthy and needed cleaning I asked for it to be cleaned and then had to ask again. Fluids poured down the plane on take off, floor was filthy, obviously not cleaned from prior flight, it was so poor, my partner stared crying not long into the flight she was so dissapointed. I have flown standard economy long haul many times with many carriers, all of these economy flights surpass Virgins premium economy. The Irony is the return flight in standard economy was far superior too. I’m not so sure. I like Virgin Atlantic, but I recently flew regular Economy with them and had most of these things. The food and multiple courses were the same. 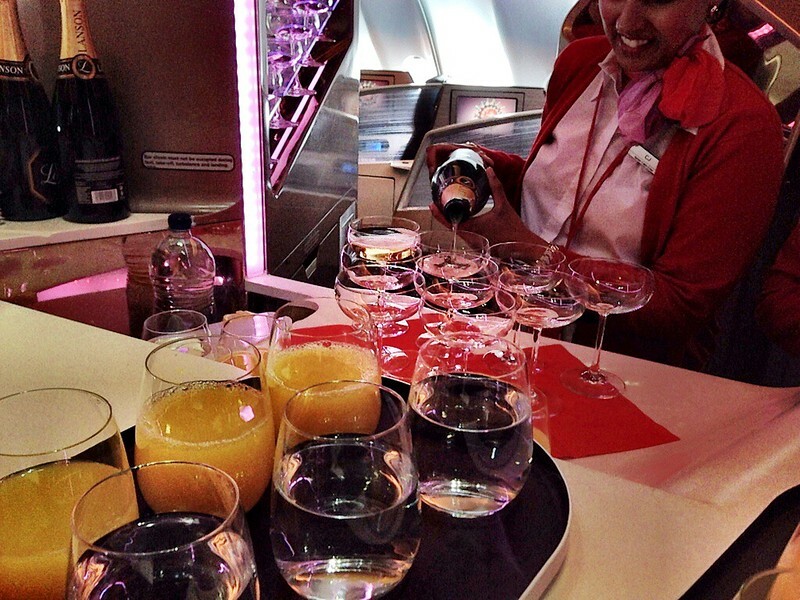 You don’t have champagne when you board but drinks throughout the flight are complimentary. We had the amenity kits, entertainment, mood lighting, hot towels. So, basically, the upgrade to Premium sounds like you are basically paying $100 + for a newspaper, a glass of champagne, and a metal fork. No thanks. The regular economy was above average for space compared to other airlines. I had plenty of room. Unless you’re 7 feet tall, it’s hard for me to see how the upgrade is worth it. We flew Virgin Premium Economy to Miami last year and it was well worth while. Apart from the better food and service the leather seats were much more comfortable and relaxing than any economy class seats we’ve had in the past. I even managed to sleep on the overnight return flight, a first for me! A few weeks ago we flew to New York using Upper Class and although it was a good experience I actually preferred the comfort of the Economy Plus seats. We are flying to New York again next August and got a good Black Friday deal on Virgin Economy Plus! In early November my husband and I returned to San Francisco from Johannesburg with Virgin Airlines via London-the flight to Johannesburg was “ok” at best-But the flight from London to San Francisco was the worst flight I have ever taken-the award formerly belonged to Egyptian Airlines. The seating was so tight that we literally could not walk when we deplaned. The trays were slanted so both of us had our drinks slide off on to our laps. The seating in coach was 3-4-3. Luckily a tiny woman was in the middle seat. Sitting on the aisle I was hit by every person who passed by my seat. It was impossible to sleep as the space was so confining, and I was being hit constantly. I will never fly Virgin again. The crew was fine, the food was better than most-but the configuration of the flight was unbearable. I had flown Virgin in the past, but it had been many years prior to the reconfiguration of the planes to accommodate flat beds. Next time I will try swimming the Atlantic, anything would be better! Even the crew noted that it was impossible not to be hit as the seating was so confining.